ESP32-WROVER module is based on ESP32 chip, the core chip is ESP32-D0WDQ6. It is a setup of ESP-WROOM-32 with an additional 4MB SPI PSRAM (Pseudo static RAM). In addition, ESP32-WROVER module also has 4 MB external SPI flash and 4 MB external PSRAM. ESP32-WROVER is a generic WiFi-BT-BLE MCU module that targets a wide variety of applications. It can be used on the low-power sensor network and extremely demanding places. Such as voice encoding, music streaming and MP3 decoding. The chip of this module is designed to be scalable and adaptive. 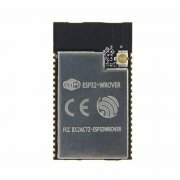 ESP32-WROVER intergrates Bluetooth, Bluetooth LE and WiFi that ensures a wide range of applications. There contains freeRTOS with LeIP on the operating system of ESP32, TLS1.2 with hardware acceleration is also built in.